In a new “DC All Access” video released by DC Entertainment, chief creative officer Geoff Johns showed off the “TV shelf” of his office, which had action figures based on characters that could be on our TV screens this time next year. 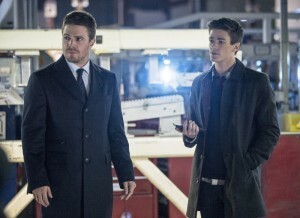 In addition to Arrow, one could find The Flash, who makes his first appearance on Arrow December 4 and 11 before going off to do his own spin-off pilot. Commissioner Gordon of Gotham is also on the shelf, followed by another guy in a trenchoat, John Constantine – a character with a pilot in development for NBC. Once could also find Hourman on the shelf, as well as a zombie to represent iZombie. Johns had very good things to say about Gotham’s writer-producer Bruno Heller, and also acknowledged that Hourman is not the first character one would think of for a TV show, also praising the writers of that project, which is in development for The CW. “I call it our dark horse, because he’s such an obscure character, but the concept of the show is really great, and the writer’s really great,” he says.